The Fall brought us Advertising Week, the ANA Masters of Marketing Conference, the Radio Show and so much more. In case you missed any of the events and panels, we highlighted some of the takeaways for you below. In a standing-room-only event at Advertising Week XII in New York on September 28, Erica Farber, President & CEO of the Radio Advertising Bureau, was joined by Adam Carolla, Perez Hilton, Norm Pattiz, CEO of Podcast One, and Gayle Troberman, CMO of iHeartMedia, to chat about the power of sound and specifically podcasting. Podcasting is such a unique form of content because it releases time constraints for programmers and listeners alike. It offers the freedom of creation, rich storytelling, behind the scenes and voyeuristic dialogues - a "no-rules" environment to provide virtually niche content to very specific groups of consumers. Carolla said "people don't want to be tied down. We live in a multi-tasking, time-pressed world and other media, such as TV, requires you to sit there and watch. Podcasting, radio - anything sound - allows you the freedom to walk around doing your thing." Troberman commented on sound and urged marketers to take a step back and focus on the power of sound because their consumers are. "Sound is UP," she said. "Radio is up 10%, podcasting is up 75%, streaming is up 34% and concerts and festivals are up over 30%. It used to be that consumers left their homes with their cell phones, wallet and keys. Today, they won't leave home without their cell phone, wallet, keys and headphones." For advertisers, podcasting provides a platform for brands to play on. Pattiz (who founded and built Westwood One) stated, "It's an uncluttered, contextual environment that works incredibly well for the advertisers that are taking advantage of it. They are putting themselves directly in the middle of content that listeners want, and who are consuming it when they want it." Perez Hilton has fun with his content every single day. He is not shy about telling advertisers that if they want to borrow his relationships, and use him to drive a call to action, he will happily drive any car and drink any beverage! Carol Edwards, SVP, Nielsen Analytics, shared results from several studies that showcase the $16-$18 ROI that radio delivered for brands in the department store, telcom and insurance categories. Results for brands large and small, local and national, and across demographics including the most sought after Millennial audience were presented. Radio works. Radio returns. Stacey Lynn Schulman, EVP, Strategy and Analytics at Katz Media Group added, "You as marketers and agencies want to know that your investment is working and it is on us as an industry to provide the data to prove that your investment is working." When asked about advertiser's reactions to these results, Pierre Bouvard, CMO of Cumulus and Westwood One, said, "They are overwhelmingly saying 'I get that radio moves the needle but how does it compare to the data we receive from TV and digital.' Well, the answer is when people hear the radio campaign, it amplifies everything else. In an insurance category study commissioned by Katz Media Group, among those people that heard the radio commercials, the awareness levels of TV, online and mobile ads also increased." Radio gets results. Period. The Home Depot's Vice President of Integrated Media, Michael Hibbison along with his agency partners Diane Fannon, Principal The Richards Group, and Ed Gorman, Managing Partner Carat USA, clearly stated, "Without the continued success in reaching customers that radio has provided us, we wouldn't be able to do all that we do today. We have a customer base that listens to radio. It is one medium that has truly stood the test of time - It's relevant, it's nimble, it pulls you in and makes you listen and the data (our data) proves it works." Cross-promotion is key. We heard from Starcom, OMD and Amplifi USA that it's not just about how radio works in isolation, but also how it works alongside other media. To amplify and extend the message is a win - win situation for not just radio, but all media. Purposeful content creation remains very important as media continues to become more fragmented. Weaving brands into content, creating disruptive content, leveraging radio personalities via original (non-scripted and non-gratuitous) endorsements to establish connections with local audiences are all unique to radio, and were championed by the agencies and advertisers in attendance at the Radio Show. Lean in to innovation. Advertisers today are looking everywhere and anywhere for ways to innovate and set themselves apart - to achieve more relevance and awareness among target consumers. Innovation will drive consumer connections among owned, earned and shared media for focused campaigns. Nearly 3,000 of America's senior agencies, marketing, and media sales teams were in attendance at the annual Association of National Advertisers Masters of Marketing Conference in Orlando, Florida. Radio companies including RAB, Katz Media Group, Beasley Broadcast Group, CBS Radio, Cumulus Media, Entercom, iHeartMedia, Townsquare Media and Westwood One were all represented and radio was fully integrated within the conference content through two key radio-hosted events. 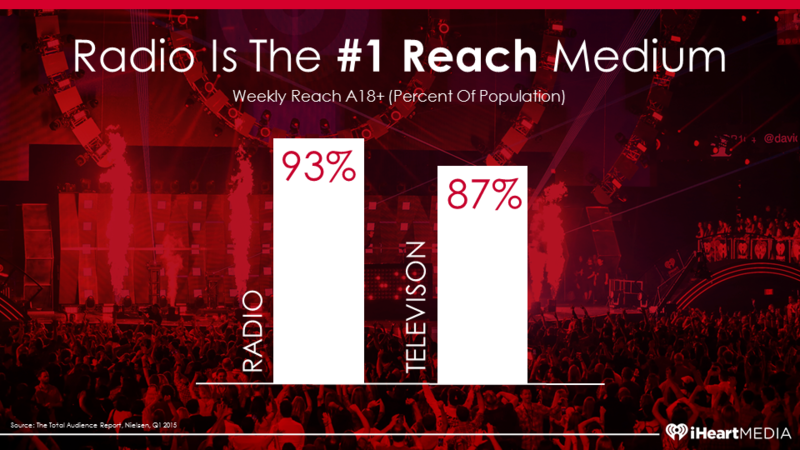 On Thursday evening, iHeartMedia hosted an event where Tim Castelli, President of National Sales, Marketing and Partnerships for iHeartMedia, revealed a very important Nielsen data point to attendees - radio is America's number one mass reach medium. This iHeartMedia sponsored event concluded with a performance by multi-platinum artist Seal. On Friday evening, Cumulus Media and Westwood One partnered with Meredith Corporation to present music star Leona Lewis and Broadway's Tony Award winner Jessie Mueller, (Carol King in "Beautiful"). This event was MC'd by Erika Grace Powell from Cumulus' NASH "America's Morning Show."